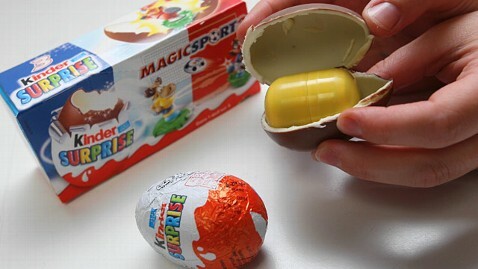 Kinder Surprise eggs - the chocolate delicacy filled with a (surprise!) toy - have had a big impact on people's lives. Consider the Winnipeg woman who nearly paid a $300 fine when she tried to cross the Canadian-U.S. border with one (the candy is illegal in the U.S., but more on that later). Or the highly creative man who used one to propose to his girlfriend. Or the New Jersey businessman who loved them so much he wanted to make sure future generations of American children could enjoy them-or, at least, a similar product-as much as he does. That would be Kevin Gass, the co-founder of Candy Treasure LLC, a Lebanon, N.J., candy company. About two weeks ago, Gass unrolled Choco Treasure, a Kinder-inspired chocolate egg with a toy inside, in stores nationwide. Previously, Choco Treasure was only available online and with limited distribution around the country. But now the candy, which costs between $1 and $1.49, is gracing shelves in national stores like Target, Winn-Dixie and SuperValu, just in time for Easter. "This is the biggest kids candy in the world, and we think it tastes great," Gass told ABC News, adding that he worked with the FDA and a U.S. Consumer Product Safety Commission certified lab to make sure his product was safe for children of all ages. Much to the distress of legions of fans, the Kinder Surprise, which is manufactured by an Italian company called Ferrero, has been banned in this country since 1938. That's when the Food and Drug Administration passed the Food, Drug and Cosmetic Act, which prohibits any " non-nutritive component" (for example, a toy) from being embedded in a confectionary product, as the Foodbeast reported. Kinder Surprise Eggs aren't safe for kids under 3 years old, a clear violation of the U.S. Consumer Product Safety Commission requirement, which states that candy-with-ensconced-toys must be safe for kids of all ages. But none of that deterred Gass. It just motivated him to figure out a way to legalize his own version of the contraband. So now, submerged inside each egg is a capsule that separates the two halves of the chocolate. The capsule also has ridges around the sides, so even a young child can tell there's something there. The toys are also larger than those in other surprise eggs. Other than safety, one of Gass's biggest challenges was finding a toy that appeals to adults and kids alike, even though children are the target audience. "Young kids love stickers. Adults don't want stickers," said Gass. So he and his team have came with gizmos that offer something for everyone: A mini deck of cards-all 52 of them! A tiny 3-D puzzle. A teensy little rubber squirty toy. "It makes me really happy," he said. While Kinder Surprise Eggs are still not legal in this country, fans have set up a Facebook page, along with a petition, to try to get the ban lifted.